Going through to Cycling Road is the faster solution to getting to Fuschia City. To begin, go west from Celadon City onto Route 16. Go through the Guard House, and you'll be on the Cycling Road (you must have a bike!). On this road, you go downhills, which means that your bike will move by itself without any action from you. However, if you try to go up the hill, you will be going very slowly. There are many Bikers that you can fight on this road, which takes up Routes 16 and 17. 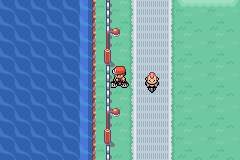 After a long bit of biking, you'll reach Route 18. Go through the Guard House after reaching Route 18. A trainer on the second floor will trade you his Lickitung for your Golduck. Route 18 is real short. After a few steps, you'll arrive at Fuschia City. Some people may choose to do things the harder way. The other way to get to Fuschia is slower and longer. To begin, fly to Lavender Town. Go south onto Route 12. Go to the second floor of the Guard House, where a little girl will give you TM 27 - Return. For the rest of the route, you'll be battling Fishermen. You'll also be able to fight two lovers in a two-on-two match. 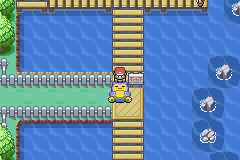 Around halfway through Route 12, you'll encounter another sleeping Snorlax who's blocking the road. You must use your PokeFlute to wake him up and catch it or defeat it. There's a house on this route with a Fisherman inside who'll give you the Super Rod, which is the best Rod in the whole game. After that, you can cut a tree, fight the trainer that's enclosed, and pick up an Iron. After going on Route 12 for a long time, you'll soon begin traveling on Route 13. Route 13 is mainly a maze filled with trainers. This maze is quite easy to get through, and most of the trainers can be avoided. Route 13 ends when the maze ends, and marks the beginning of Route 14. Route 14 is simply going south. You'll have another opportunity to have a two-on-two match with the Twins. After a short Route 14, you'll get to Route 15. You can find TM18 - Rain Dance by cutting the tree and going all the way to the end. Here, you'll be able to fight in another two-on-two match with Fighting Pokemon. One of Prof. Oak's aides is in the Guard House that marks the end of Route 15. If you have captured at least fifty Pokemon, he'll give you an Experience Share. This is a very useful item in that it shares battle experience with all the Pokemon on your team. Finally, you'll arrive at Fuschia City.